I’m a woman of simple needs. Give me some biscuits, a mini-USB charging cable and a cushion with an animal on it and I’ll be happy for hours, but there is one thing I want more than anything else in the world – a garden to call my own. I’m not greedy, a small patch will do. I just want somewhere to grow my own plants, attract wildlife and... then watch those first beasties get violently devoured, by bigger, more impressive ones to keep in my garden. Is that too much to ask? Since I don’t have anywhere like that in real life I’ve decided to revisit Viva Pinãta: Trouble In Paradise’s little garden of horrors and wanton candy-based slaughter. It’s a small customisable space that sees you set up houses and trees for things such as the earthworm-like Whirlms and dog-like Barkbarks. By managing your wildlife retreat you can attract rarer sweet-filled animals over time until you have a thriving oasis on your hands. There are opportunities for day trips to the desert to find beasties to bring back home with you, but mostly it’s all about staying in one patch of land and enjoying the delights of nature around you as you bend it to your will and play God. Though sitting around in a garden all day isn’t quite as relaxing as I thought it would be. The thing with gardening is that it takes a lot of work to transform it into a place worth visiting, but the labour in that process is part of what makes such a simple location so satisfying. It’s a tiny idyll that’s been crafted by your own hand and to your own exact specifications. So if you find a beach theme more relaxing than, say, a forest then you can build that for yourself. Of course there’s a long way to go before you can achieve that though; first you need to master the basics of dealing with regular, brown dirt and bugs. Viva Pinãta is great at capturing that joy of growing your first plant and seeing it flower, but also that moment when, five to six plants into your gardening adventure, that joy turns to panic as you realise just how much you actually have to manage all at once to keep everything alive. Once you’ve got a vague handle on watering your plants so they don’t die, there’s also animals to consider. There’s a joy in attracting your first adorable Bunnycomb thanks to your crop of carrots, but there’s also something satisfying about those very same bunnies becoming bait for fox-like Preztails. After a while, gardening becomes a battle against the forces of nature. Sure you get to watch the various courtship dances of the creatures around you, but they also have a habit of destroying all the plants you’re trying to grow. You might forgive something cute, like a Taffly, for eating your fruit harvest, but inevitably your garden will eventually attract pests that will destroy everything and make other pinatãs sick if you don’t form a strategy to deal with them. Unfortunately this is a world without slug pellets so you have to deal with Sour Shellybeans (basically grumpy snails) the old-fashioned way – by smacking them with a shovel. If that feels too mean you can just watch in horror as they destroy all your hard work, or work to tame them to restrict the damage. If you do manage to master your pest problems you’re rewarded with totem pieces that can block them entering your space forever. 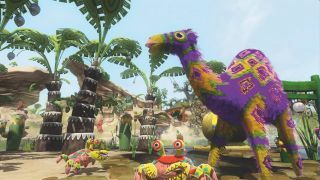 That constant battle with your tiny plot as you slowly improve it over time and attract rarer pinatas works as a surprisingly good training ground for a real garden. There’s always so much going on that it needs constant care and attention, although in real life there are more slugs and fewer sweets. Still, it’s the sense of managing chaos and building up something beautiful from nothing that makes Viva Pinãta’s garden such an inspiring location to spend a few hours.